Boomers have recently hit the 65+ category. As an example, the older population--persons 65 years or older--numbered 39.6 million in 2009. They represented 12.9% of the U.S. population, about one in every eight Americans. By 2030, there will be about 72.1 million older persons, more than twice their number in 2000. People 65+ represented 12.4% of the population in the year 2000 but are expected to grow to be 19% of the population by 2030. The number of 25- to 44-year-olds grew by 30 percent between 1980 and 1990 and shrunk by 3.4 percent between 2000 and 2010. 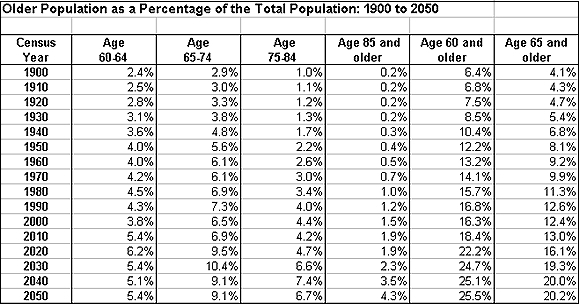 The population aged 65 or older grew 23 percent from 1980 to 1990 (Source: "Snapshots of the Nation"), more than twice as fast as the population as a whole, and grew by 15.1 percent between 2000 and 2010. However, between 1990 and 2020 the number of those 50 and older will increase by 74 percent, while the number under 50 will increase by only 1 percent. In 1990 one in four Americans is 50 or older. By 2020 one in three will belong to this group. It's difficult to predict exactly how much the increase will be because changes in the mortality rate can have a big effect on the numbers. In the 1970s the mortality rate fell substantially, while it fell more slowly in the 1980s. See The Age Wave: How The Most Important Trend Of Our Time Can Change Your Future.